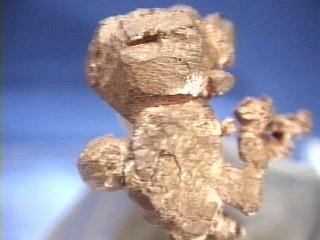 Native copper (copper found in a chemically uncombined state) has been mined for centuries and now is all but depleted as an economically viable ore. Other copper minerals are far more economical to mine and purify into metallic copper that is used for wiring, electrical components, pennies and other coins, tubing and many other applications. Native copper is still found in limited quantities in once-active mining regions. These finds are now valuable as minerological specimens and ornamental pieces. Fine specimens only rarely demonstrate crystal faces and these are prized above otherwise similar specimens. Color is copper colored with weathered specimens tarnished green. Crystal Habits include massive, wires and arborescent or branching forms as the most common, whole individual crystals are extremely rare but when present are usually cubes and octahedrons. Occasionally, massive forms will show some recognizable crystal faces on outer surfaces. Associated Minerals are silver, calcite, malachite and other secondary copper minerals. Notable Occurrences include Michigan and Arizona, USA; Germany; Russia and Australia. Best Field Indicators are color, ductility and crystal habit.